Hi! 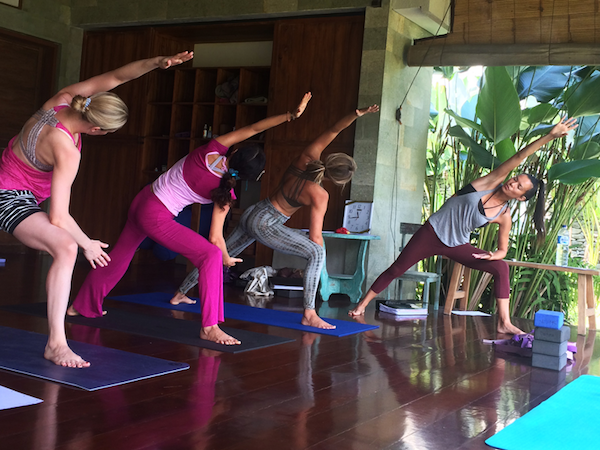 I’m Alina and this is week 3 of my 4-week yoga teacher training in Bali with Routes of Yoga. Join me as I share with you the amazing things I learned from Daphne and Anton in part 3 of my yoga teacher training diary series! We started week 3 with a quite strenuous morning yoga class, which also builds up on what we learned about chakras last week. Today’s agenda, however, is to let us have more experience in the Teaching Lab, accompanied by lessons on anatomy and yoga philosophy. I have never felt this present, balanced, and at ease. I was in such a good mood and had this feeling of "centeredness" I've never felt before. Yes, the schedule is tight and all the amazing things I'm learning so far can sometimes feel like a lot to process, but this whole experience has touched me deeply. And getting to experience all this with the stunning view of palm trees across the rice fields from our Yoga Shala adds all the more to the beauty of the experience. This made me think about what is missing or what could be optimized in my life. I realized what I need is more days off, rather than a raise. I need more contact and connection with nature. On our day off, we went on a nighttime volcano hike and it really helped put things into perspective for me – we are so small and our life relatively short. How can I integrate this beautiful experience in my daily routine back home? The next day started with another yoga class, and after breakfast, we start learning about the art of yoga sequencing. It was a huge help to all of us that our teachers started us with a modular system they created to help us learn how to create a balanced sequence. Note to self: self-practice is key! Teach what you practice and vice versa, and use your personal experiences! After Anatomy and 10 min. Pranayama practice, we have the rest of the evening to ourselves. To help us learn more about the basics to analyzing poses in sequencing, we started the day with a yoga class that included basic to intermediate-level yoga poses spanning arm balances, inversions, backbends, and standing balance poses. Afterwards, we have the first Adjustments class. It feels really strange to touch people and I feel so unsure on how strongly to push and pull. Thankfully, Daphne is a very experienced and empathetic teacher. We all love her adjustments, and she breaks them down really well. To help us get started, we practice in groups and give each other straight feedback on pressure and positioning—though we agree that you should do adjustments only if you feel comfortable with it. We have another round of Teaching Lab, which serves as a reminder for me that every day, you have to step out of your comfort zone. I learned that my primary focus is on observing and guiding people and demonstrating, and next to that is focusing on my "yoga voice," and how to move in the room. It IS challenging, but it's the path towards growth. At this point I was already feeling a bit tired, but I'm glad we went out for a healthy dinner at Soma. After that, it was time to work on our homework for the next day: we have to write our first own sequence with 16 (!!!) poses using the modular system. Trying not to get nervous, I think about how I'll be able to remember all those poses. Wow, this morning practice with Daphne was so physically challenging—she guided us through 135 minutes of Yoga and Pranayama! Not gonna lie, my legs were shaking afterwards and I was almost crawling towards breakfast. But after some food and drinks and little bit of rest, it felt SO GOOD knowing and feeling my muscles just got a good workout. Next up, Anton introduced us to Kriyas (cleansing techniques). Kriyas help your body get rid of waste so your energy is redirected to something else. It was hilarious because some of the girls have never done Neti (nose shower) so we were all lining up along the rice field giving it a try. We also learned Tratak, or candle meditation. Then came the Teaching Lab to demonstrate our 16-pose sequence! I'm trying my best to not get too dependent on my notes, as Anton reminds us the importance of being fully present as we demo the poses. Everything we've been doing so far is really helpful—I'm learning a lot about sequencing! Confession: I always feel nervous before Teaching Lab as it is slightly outside my comfort zone each time, demonstrating in front of the group, always receiving direct feedback. I try not to put myself under too much pressure and remind myself that we are just at the beginning. I had so much fun during the Adjustments class led by Daphne! Even though I was very nervous in the beginning, once you know the basics — and can watch how the body in front of you opens and gets deeper into the pose – it is impressive and very satisfying. We revisited the Kriyas from yesterday’s introduction, then we moved on to Uddhiyana Bandha and Nauli, then practiced Pranayama as a lead-up to a 90-min. class with Anton. After that, we settle down and let Daphne guide us through a deep, philosophical study of the Bhagavad Gita. These past two days have been very physically demanding. I can feel my mind and body getting tired. But despite this, I still believe all the effort is a thousand times worth it, and I'll tell you why. Up until now, teaching has always felt hundreds of miles away...like a distant dream that's just not attainable for me. But now, I feel like I might really be able to teach at the end of this training! And it's not just my personal progress that I've noticed—I see it in our whole group too. Daphne, Anton, and the Routes of Yoga team has made the group (and this whole program) feel like a nice and comfortable safe space where we can all practice with empathy and love. Include saying thank you to your teachers and the everyday life lessons (people who challenge you), where you can practice patience, non-attachment, and serenity. Life teaches you something every day. Create space to observe, listen, and change! Find your true calling, your nature, and you will learn what you have to contribute and share. These actions become effortless when you follow your true nature. All the things that I want and how I want to be as a yoga teacher...I believe these will come with practice. Adjust your own expectations and it will settle in. Focus on the progress and not the weaknesses to gain new motivation. So far with this whole teacher training program in Bali, I often feel very tired—what with the early wake up times and a lot of physical and mental exercises. But even when I feel tired, I absolutely love what we are doing and THAT makes it easy to keep on going and learning every single day. Sometimes I wonder...is this what it's like and how it feels to be a yoga teacher? Could I pull this through and commit to it for years and decades to come? Can you?